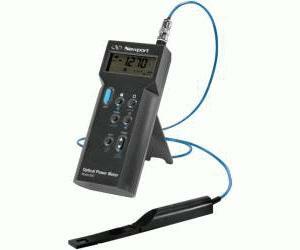 The Model 840-C hand-held optical power meter is fully compatible with all of the Newport 818 Series Low-Power Si, Ge, and InGaAs detectors. Detectors connect to the power meter through an in-line calibration module that is dedicated to each detector. These detachable modules provide the Model 840-C with calibration and operating information specific to the assigned detector. Various detector accessories allow for free-space, as well as for fiber coupled power measurements. DC and AC peak-to-peak power measurements can be displayed in units of W and dBm on the 4 digit, backlit LCD of the instrument. This power meter is being phased out. Supplies are limited to stock on hand. This item has been replaced by the Newport 1916-C, 842-PE or 1918-C.